TransMagic develops easy-to-use, highly efficient and precise 3D multi-computer-aided engineering (CAD) interoperability software to enable seamless reuse of 3D engineering and manufacturing data in multiple software environments. TransMagic was founded in 2001 by two CAD/CAM engineers with a combined 44 years of industry experience and an idea. In 2005 Todd Reade, CEO, was vacationing on a beach in Florida when his partner called to say he had just discovered a cracked version of TransMagic’s software selling on dozens of sites for $99. This issue had a major impact on TransMagic sales. By 2008 the pirates were cracking TransMagic software in less than a day despite the company having changed its licensing several times. In 2009 TransMagic installed very expensive IP protection software with Department of Defense-level encryption—but Russian pirates were able to access the TransMagic server and put a Trojan virus into the system, which enabled them pull out all of the company’s secret information and build a license key generator that offered the software free to anyone in the world who sub- scribes to pirated software. TransMagic changed its license keys several times, but the pirates continued to crack the product within weeks of each new release. Crack license keys opened 90 percent of TransMagic’s software capability, at a value of $15,000 per license. In 2010 Reade got a call from Chris Luijten, CEO of SmartFlow partner company IT Compliance Association (ITCA), who had been doing some research and wanted to let him know that dozens of crack sites worldwide were offering TransMagic software for free. Luijten explained that ITCA provides compliance resolution services that are targeted to particular regions worldwide, and uses innovative SmartFlow software, which intuitively compiles data and provides insight to clients on how non-compliance and piracy are affecting their business, customers, and income. Armed with actionable information, businesses can more easily enforce compliance and recover lost revenue. With SmartFlow installed, TransMagic is receiving richer information on infringement, including usage data, number of times the software is opened, dates of use, what file types have been opened and saved, and special functions that have been performed. 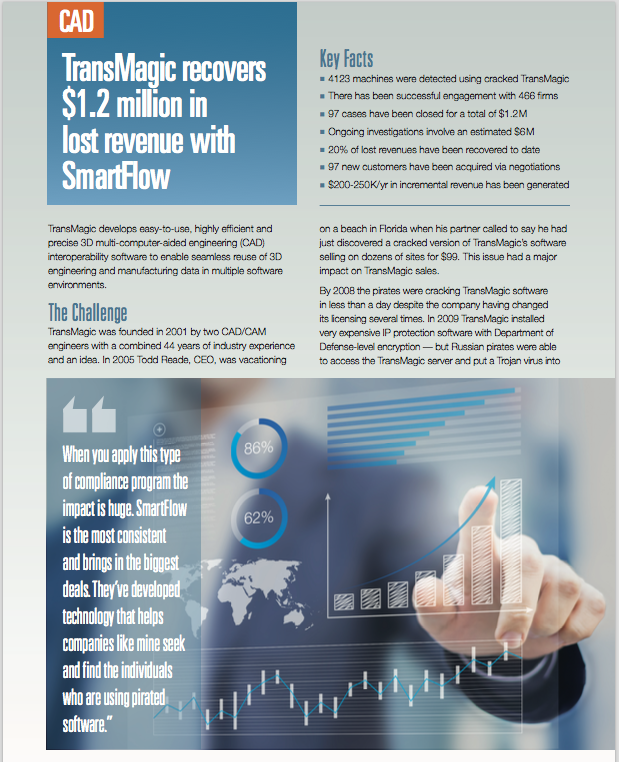 SmartFlow has provided an assigned compliance resolution representative who knows TransMagic’s products and has implemented a customized process to maximize efficiency and revenue. 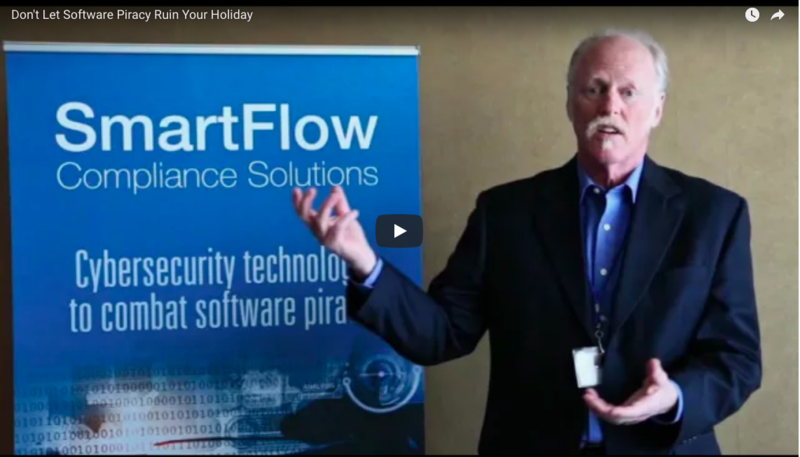 The SmartFlow solution is a win/win for TransMagic because it not only recovers lost revenue from pirated software, but also provides the company with new customers as an alternative to a punitive approach. Statistics from SmartFlow show that since 2010, 4123 machines have been detected using a cracked version of TransMagic and 1347 computers within 879 organizations have been identified. ITCA has successfully engaged with 466 of those companies and to date has closed 97 cases for a total of $1.2M. In addition, ongoing investigations involve an estimated $6M in infringements. About 20 percent of lost revenues has been recovered to date and TransMagic has gained 97 new customers, some of which buy more seats and continue to pay annual maintenance. TransMagic is averaging $200-250K per year in incremental revenue.